Gosh Kathleen - I was there a few years ago. What a place. Good shot! I like the fact that you took this photo with the clouds and some depth of field. Good for you! 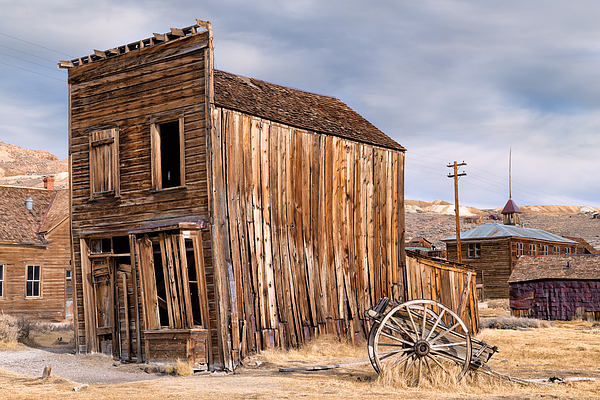 Bodie is such a beautiful and wonderful place - you captured it beautifully. Congratulations on your win in the W (wood) competition. Congratulations on your tie win in ABC GROUP'S W is for WOOD! 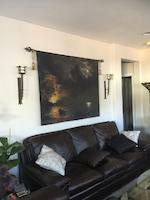 Your unique image will be featured on the Abc Group's home page! 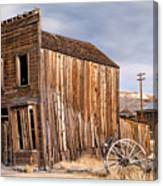 Fine art photograph of a classic western street in the historic eastern Sierra gold mining town of Bodie, California. A wooden wagon with oversized wheels rests beside the weather-warped and radically leaning Swazey Hotel on Main Street. A cupola-crowned schoolhouse, erected in 1879 on Green Street, can be seen squatting in the background to the left of a rust-clad garage. Mine dumps crest the ridge line. Gold was discovered in Bodie in 1859. 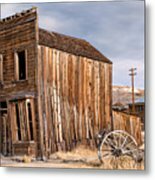 By 1879 there were an estimated 10,000 people living in Bodie and 2,000 buildings, including 65 saloons. An estimated $100 million in gold bullion was extracted from the mines from 1876, when the Standard Company discovered a profitable deposit of gold-bearing ore, until the last mine closed in 1942, due to War Production Board order L-208, shutting down all nonessential gold mines in the United States. All products carry a 30-day money-back guarantee. ©Kathleen Bishop. kathleen-bishop.pixels.com. All Rights Reserved.